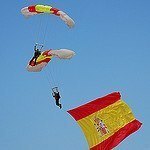 This Free online Spanish to English dictionary includes most of the vocabulary introduced in the Spanish lessons on this website. Queda a dos o tres manzanas de aquí. It is located two or three blocks from here. Quiero presentarles a unos amigos. I want to introduce some friends to you. Let's hope that we see each other soon. A veces el motor no arranca. ¿Me podría arreglar el coche? Could you fix my car? [She] is with her grand-parents. I have a six-month-old girl. It is made of ebony. Give me half a kilo. What would you like? / Can I help you? Good morning. / Good day. ¿A cómo la docena de huevos? How much for a dozen eggs? En la base de Torrejón. ¿En qué trabaja tu marido? Siga derecho hasta encontrar la gasolinera. Continue straight ahead until you find the gas station. Esto es un sitio precioso. ¡Qué bien habláis el español! How well you speak Spanish! He is [stationed] at the Torrejón Base. Tengo que estar en el aeropuerto a las dos. I have to be at the airport at 2:00. Do you (familiar plural) like ...? Do you (familiar singular) like ...? Do you (formal singular) speak ...? Do you (formal plural) speak ...? Encantado de hablar con vosotros. Hace dos semanas que estamos aquí. Is [it a] long [time] that ...? ¿Hace mucho que estáis aquí? Will you give me a small discount? Is there ...? / Are there ...? ¿Hay una gasolinera cerca de aquí? What hors d'oeuvres are there? Hay que mirar el radiador. It is necessary to check the radiator. Un billete de ida para Madrid. A one-way ticket to Madrid. irme / Tengo que irme. irnos / Tenemos que irnos. area in the north of Spain famous for its wines. It is too long for me. I'll take a look [at it]. ¿Qué es lo que tiene? What is the matter with it? You are wanted at the phone. ¿Me podría mirar los frenos? Could you check the brakes? Take a good look at it! Good night! / Good evening! Don't you (familiar singular) think ...? Un pasaje de ida y vuelta para Mallorca. A roundtrip air ticket to Mallorca. Hay que poner a punto el motor. The engine needs a tune up. ¿Cuánto quiere por esa mantelería? How much do you want for that table linen? En la próxima esquina, tuerza a la izquierda ..
At the next corner, turn to the left. Can I bring it in Thursday? La estación queda al final de la calle. The train station is located at the end of the street. This one fits me better. Tengo que regresar a la base. I have to return to the base. rico, -a / Está rico. ¿A qué hora sale el próximo tren? When do you leave for Jerez? Los señores Serrrano son de Madrid. Mr. and Mrs. Serrano are from Madrid. It is three hundred pesetas. Do you (familiar singular) like? It is pleasing to you. Pilar, ¿no te parece ...? Pilar, don't you think ...? Tengo que estar en el aeropuerto a las dos y cuarto. I have to be at the airport at 2:15. El avión tiene la salida a las tres. The departure time of the plane is 3:00. Jessica is twelve years old. Son cincuenta pesetas por todo. It is fifty pesetas for everything. All (of us) are well. Tome. Quédese con el cambio. Shall [I] bring to you? Half a pound of grapes. What are we going to drink? I, a glass of beer.